As the world marks the centenary of that war, their families recall their stories of valour. A 1920 painting by Thomas Flowerday Clarke titled The second ride of Lance Dafadar Gobind Singh, VC at Peizieres France Dec 1, 1917. They were part of the British Indian Army that fought in the First World War. They braved gunfire, saved lives and chased enemies out of trenches, largely unacknowledged by history. As the world marks the centenary of that war, their families recall their stories of valour. Nothing would deter Gobind Singh Rathore from delivering the message. Not enemy fire. Not his dead horse. Not even sheer exhaustion. The story goes thus: On December 1, 1917, the 2nd Lancers (Gardner’s Horse) unit of the British Indian army was surrounded by enemy German forces in Epehy, France, at the height of the Battle of Cambrai. The unit was cut off from its brigade, headquartered six miles away, on the outskirts of Peizieres. Someone had to ride a horse to Peizieres to deliver a message about the unit’s siege by the Germans. Lance Dafadar Gobind Singh Rathore and Sowar Jot Ram volunteered to do so. Both were given different routes. Ram was killed on the way in enemy fire. Rathore galloped along until, half a mile later, his horse was shot dead in a hail of gunfire. He briefly lay near his horse, and then, hoping he wasn’t being watched, got up and ran furiously. More gunfire followed. Rathore fell down, pretending to be dead, and then got up and ran. This went on till he finally got to the brigade headquarters. Now, a message had to be relayed back to the unit at Epehy. He mounted another horse, but two-thirds into the journey, the animal was shot dead. He ran back under enemy fire to his unit. An hour later, another message had to be sent to the HQ and Rathore volunteered again. His colleagues told him that he’d taken enough risks, but he said that he knew the route like no one else did. So he set off on another horse. Half way through Epehy, a direct hit from a shell cut his horse into two, and Rathore ran on foot again. Dehydrated and wounded, he arrived at the HQ, where he volunteered to make another trip, but was denied permission. For his determination, Rathore was given the Victoria Cross (VC), the highest gallantry award for valour “in the face of the enemy” to members of the armed forces of British territories. Rathore was born into a farming family in Damoi village, Rajasthan. He joined the British Indian army along with brother Amar Singh in 1910. When the Great War broke out, the unit had to be deputed to Europe. Both brothers volunteered to go to the War, but their officer advised that one should stay back to look after the family. Amar stayed back, and Rathore left for France. Besides the Victoria Cross, Rathore was awarded 100 acres of land in Punjab. After Partition, the land fell in Pakistan. By then, Gobind and Amar Singh had passed away. Amar Singh’s son Tez Singh petitioned the Indian government to give them an equal measure of land in Rajasthan. Col Rajinder also recollects his grandfather studying up to Class V after the war. “He never went to school. After he got the Victoria Cross, he wanted to study. His commanding officer agreed and arranged for his study till Class V,” he says. Harbans Singh’s father Sepoy Ude Singh was one of the few survivors of the bloody Battle of Gallipoli. For Harbans Singh, a frail 89-year-old, the First World War does not signify conflict, but friendship, a bond born of war, but one that lived long after the last troops returned home. It began on June 4, 1915, the first day of the Third Battle of Krithia, fought on the Gallipoli peninsula (present-day northern Turkey) between the Allied (British and French) forces and the Turkish/Ottoman military. The Turks had overpowered the British, and Reginald Arthur Savory, a British officer in the 14th Sikh Regiment of the British Indian Army, was on the frontline in the trenches. Singh’s father Ude Singh was a sepoy in the regiment. “When Savory did not return from the war front for long, my father went in search of him, though his colleagues dissuaded him. He finally found Savory wounded in the head and carried the officer back to the safety of the unit. My father carried him to the doctor and took care of him,” says Singh, a retired Panjab University employee. Gallipoli was a bloody battleground, with only 134 of the 574 men of the 14th Sikh Regiment and only two of the 15 British officers of the unit surviving. “My father’s was the only life-saving act in the campaign. And Savory was one of the two officers who survived it, thanks to my father’s help,” Singh says . Savory would honour Ude Singh later too. “My father retired in 1917 and the two lost touch. In 1934, when Savory was posted in Dehradun as a lieutenant colonel, my father went to meet him. Savory offered him his own chair,” Singh says. Singh feels there was a “divine connection” between his father and Savory. “After Independence, Savory left the country on December 9, 1947, for England. The same day, my father passed away,” he says. In 1968, when Savory visited India, Singh wrote a letter to him asking if he could come to Delhi to meet him. “But he came to Chandigarh to meet us. The Punjab government wanted to host him but he stayed at our place. He would reply to all the letters I wrote to him till 1980, when he passed away,” Singh says. A corner in Singh’s small flat in Chandigarh is dedicated to the story of his father and Savory: it has a photograph of his father along with Savory besides other war insignia such as letters and articles his father used in the Gallipoli campaign. Every morning and evening, he and his wife light a lamp next to it. “I wrote many letters to Indian and British authorities requesting them to recognise my father’s work of saving the life of an army officer. But the Indian government says it was an act done under British India, and the British government says it is too old an incident,” he says. Singh will put off the centenary celebrations until June 4 next year. “That would mark 100 years of Ude Singh’s heroism. I will call a few good people and remember that there existed a good man who saved a precious life in WWI where everybody else killed. I only want to live till that day,” he says. Lt. Col Balbir Singh Negi (retd) shows his father Darwan Singh Negi’s medals at his home in Lucknow. Amidst a rain of bullets and grenades on the night of November 23, 1914, four months after the First World War broke out, Naik Darwan Singh Negi of the 1st Battalion of 39th Garhwal Rifles, twice wounded in the head and once in the arm, pushed on to recapture trenches lost to the Germans in Festubert, France. In what would later become a standard practice, the Garhwal battalion flanked the trench from both sides, bombing, firing and bayoneting its way in. Negi, though wounded, remained among the first to push forward in each traverse. By the time they succeeded, an injured Negi was drenched in blood from head to foot. For his act of bravery, Negi was awarded the Victoria Cross (VC), and with this, he became the first Indian recipient of the highest gallantry award given to soldiers of the Commonwealth. “While presenting the Victoria Cross on December 5, 1914, when King George V asked him, ‘What can I do for you?’, he simply replied that there weren’t any schools in his area and that a middle school should be started at Karanprayag (Chamoli district, Uttarakhand). The request was immediately taken up,” recalls his son Lieutenant Colonel Balbir Singh Negi (retd), 74. Why Karanprayag, which was 25 miles from his native village Kafarteer? “Karanprayag was a central town, the village wasn’t. Such was the simplicity those days,” says Balbir Singh Negi. Apart from the Victoria Cross, a century-old parchment paper telling Naik Darwan Singh Negi his duties, a photograph of Commander in Chief of the then Indian army Field Marshal Claude Auchinleck adorning Negi with his Victoria Cross in 1948, a chapter on Negi in a coffee table book, and a handful of medals are among the family’s prized possessions. There is a Darwan Singh Negi museum in Lansdowne but it is as much about him as it is about the Garhwal Rifles, documenting its history through artefacts, photos and weapons. Despite his achievements, Negi did not want his three sons to join the Army, simply because “he had seen way too much destruction the Great War had caused”. So Prithvi Singh Negi became a civil servant and Dalbir Singh Negi became a professor but, Balbir Singh Negi, the youngest, was too charmed by the Army. Like his father, he joined the Garhwal Rifles (5th Battalion) and his son went on to command the 13th Battalion of the Garhwal Rifles at the Siachen glacier. Operation Bajrang in Assam, 1990,” Balbir Singh Negi says. “But as soon as I would join a war, it would become peaceful,” he chuckles. His father, however, was humbled by the war, he says. Negi took premature retirement in 1924 and began social work, helping war widows and and opening a school in the village. He also requested the authorities to extend the road link and provide a rail link to Karanprayag. Though the former was complete before Independence, the second is yet to become a reality. “The British immensely respected him,” says Balbir Singh Negi, who now lives in Lucknow with his wife. “But the Indian government has not recognised his contributions; the Army rose to prominence the world over due to his act of valour.” Balbir Singh Negi hopes his father is given a Padma Bhushan or a Padma Shri by the government. He also laments public apathy to his father’s illustrious career. When Negi’s native Kafarteer village was selected under the rural scheme Swarnjayanti Gram Yojana, other villages in the block objected, alleging bias in selection due to the village’s history; there were whispers of a colonial baggage. “They were so unhappy with our village’s selection that they even filed a case. Three years later, the court didn’t find anything wrong with the government’s decision to choose Kafarteer but by then, the scheme had already lapsed,” he says. Mohan Nikam; certificate given to Havaldar Dhondi Nikam. The Nikams are not just a family of armymen, they are a family of armymen who’ve fought wars — big ones like the First and Second World Wars, and the 1971 India-Pakistan War. Brigadier Mohan Nikam (Retd), 64, credits his family’s wartime profile to his village, Apshinge, “where every boy dreamt of being in the Army”. Speaking with the precision of a soldier, he says, “Apshinge is approximately 16 km south of Satara and 2 km off the Mumbai-Bangalore highway.” During World War I, he says, “90 per cent of the able-bodied men in Apshinge were employed with the British Army.” One of them was his grandfather, Havaldar Dhondi Nikam, of the 1/103 Maratha Light Infantry. The bullet injury left Havaldar Nikam with “a lifelong disability”. “He could not travel anymore even though he lived till the age of 90. Every evening, he used to go to a local temple and sit there for long,” says Nikam. But he was always grateful to the soldier who saved his life. “When he was shot at in Kut-al-Amara, a soldier of a neighbouring village carried my grandfather to a British captain, who later took him to an army hospital. My father visited that soldier’s home and would help them by giving grains or whatever they needed,” he says. Havaldar Nikam’s disability didn’t discourage his son or grandson from joining the Army though. Ramrao Dhondi Nikam, his son, was a colonel who fought in World War II, and was later commissioned into the Indian Army in 1947. Ramrao Dhondi Nikam’s son Brigadier Mohan Nikam was posted in the Mendhar-Rajouri sector during the 1971 war, and was a part of Operation Pawan in 1987 when the Indian Peace Keeping Forces captured Jaffna from the Liberation Tigers of Tamil Eelam. Mohan Nikam’s home is filled with war memorabilia such as the Princess Mary’s Christmas Box, a five-inch bronze box gifted to all soldiers, including Havaldar Nikam, by the British royal family in the Christmas of 1914. “This Christmas, this gift will be 100 years old. Don’t you think this small box is witness to a very significant period in our history?” he asks. For Nikam, it is “these things and the stories of valour” which inspired him to fight for the country. “For others, these could be just some metal objects or old pieces of paper but for us, they are symbols of our glorious past.” Nikam’s younger brothers Captain Udaji and Col Sayaji followed him in joining the Army and are now retired. Kulbir Singh Chadha shows the service discharge certificate of his father Sepoy Manna Singh. A crumpled, half-torn paper certifies that Manna Singh, a sepoy in the first battalion of the 2nd Punjab Regiment, British Indian army, has been discharged of his services and been paid all his arrears. The paper, in English and Urdu, mentions his date of discharge as May 15, 1923, and his tenure as nine years, five months. The document is the only tangible legacy of Manna Singh’s participation in the First World War. Every other war-related insignia was lost to Partition. When Singh’s wife Goma Wanti fled Lahore in 1947, in the ensuing chaos, she left behind the British War Victory Medal awarded to Singh, as well as some photos and articles. Today, the discharge certificate is glued, taped and laminated and also stored as a scanned image in the laptop of Manna Singh’s grandson Satbir Singh Chadha, a 25-year-old mechanical engineer. Chadha digitised the certificate after British and Indian government agencies approached the family for a World War I centenary commemoration project that will include the publication of a coffee table book, as well as holding of exhibitions. A native of Hudwal village in Kaimalpur district, now in Pakistan, Singh took part in World War I campaigns in Turkey, Russia, France and Iraq. He retired in 1923 and set up a grocery shop in Hudwal. “He was a true patriot and personally knew Sarhad (Frontier) Gandhi, Khan Abdul Ghaffar Khan. He had erected a 30-foot tricolour over our shop. And no British officer dared remove it. He had a strong built,” says his 75-year-old daughter Balbir Kaur. In 1944, when he passed away from food poisoning, “the British came and asked my mother if they could remove the flag before daring to take it off,” she says. After his death, the family shifted to Lahore. “Our mother was his second wife. She went to Lahore with her seven children. During Partition, we came to Karnal, Haryana, leaving everything behind except my father’s torn certificate,” says his 75-year-old son Kulbir Singh Chadha, a retired government officer. The certificate helped Goma Wanti get a clerical job in Karnal jail that helped her raise her children. She passed away in 1972 and did not pass on stories of her husband’s war campaigns to her children. However, despite little knowledge of his army life, his 84-year-old son Harbachan Singh Chadha says he “felt inspired” enough to work in the Army briefly before he joined the Punjab transport department. Singh’s three sons and their families now live in a modest house in Rajpura, Punjab. 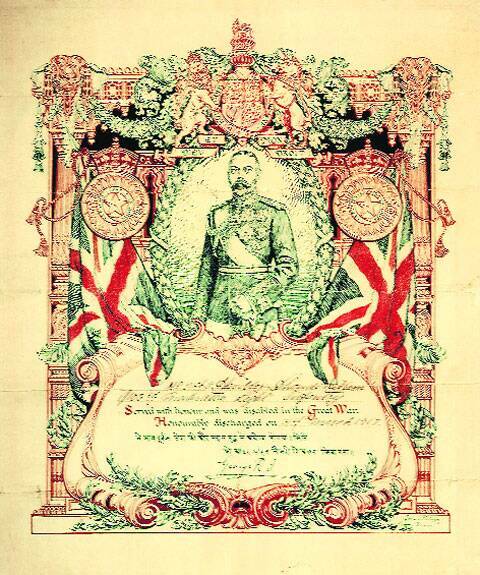 At the beginning of the First World War, Indian political opinion supported the British. Nationalists like Mahatma Gandhi and Bal Gangadhar Tilak felt that a vigorous contribution to the British effort in the First World War would be duly rewarded with dominion status after the war. India’s contribution was massive. Military and financial help poured in from all over the country. The greatest contribution was in terms of manpower — 1,440,437 soldiers and labourers were recruited, 1,381,050 of them serving overseas in theatres of war as far apart as France, Belgium, Aden, Arabia, East Africa, Gallipoli in Turkey, Egypt, Mesopotamia (modern-day Iraq), Palestine, Persia, Salonika, Russia and China. The Indian establishment bore the cost of these troops and gifted 100 million pounds in 1917 towards the war. Nearly four million tonnes of materials and over 1.75 lakh animals were also provided. The Commonwealth War Graves Commission estimates that 1,16,000 Indian soldiers died of all causes; 9,200 decorations for gallantry were awarded to Indian jawans. The Indian Army sent seven expeditionary forces to serve abroad. The 1,38,000 men of Expeditionary Force A comprising the 3rd (Lahore), 7th (Meerut) and 1st and 2nd Cavalry Divisions were the first to arrive just in time to stabilise the crumbling Allied front in October 1914 at the crucial 1st Battle of Ypres in Belgium. The Indian Corps provided half of the assault force at the Battle of Neuve Chapelle in March the next year, the Lahore Division being thrown into the counter-attack at the 2nd Battle of Ypres in April. Heavy losses were sustained at Loos in September. Low morale coupled with heavy casualties and underlying political factors saw the withdrawal of the Indian infantry divisions from France in December 1915. Some 6,75,000 Indian troops fought in the British campaign to safeguard their oilfields in Mesopotamia and Persia. With the exception of aircraft, all supplies for the campaign came from India too. Initial successes were negated by incompetent military leadership. The capitulation of the 6th (Poona) Division at Kut-al-Amara was followed by great suffering for the Indian prisoners of war at the hands of their Turkish captors. Some 4,000 out of 10,000 perished due to starvation, disease and ill-treatment. Eight Indian infantry and cavalry divisions were deployed before ultimate victory in this theatre, which came at a cost of 30,000 Indian dead. The victory here and in Palestine, both won with the aid of Indian troops, ensured British control over the Middle East and its vital oil resources. The Great War had a profound effect on India and Indians. Jawans came back from Europe and the Middle East filled with new ideas, not the least of which was wonder at the zeal with which they had witnessed the people of these regions fighting to preserve liberty. The disappointment over not receiving the expected reward of political autonomy gave a boost to the emerging freedom movement, changing the course of Indian history. The anti-British mood was exacerbated by heavy casualties, new taxes to offset the huge expenditure in the war, rising prices, forced recruitment, the worldwide influenza epidemic and crop failures resulting in food shortages. For all its impact on our history, we have chosen not to commemorate the war’s centenary. Our intentions to sup at the high table of the comity of nations could be strengthened by letting the world know of our sacrifices and contribution to the fight for liberty and against fascism and oppression. Bajwa is a defence analyst and military historian.